Why should landlords or agents read a legal book? Isn’t it better to get on with the job of renting out properties than delving into legal tomes, which might deaden the soul? Well no. Sometimes a knowledge of the law can be a great help when managing tenancies. Often it can save you a fortune in legal fees if you know enough to avoid trouble in the first place, or you know enough to understand the advice you are being given by experts, how to interpret it and how to read between the lines – professionals often have their own agenda. The English legal system on housing law is complex and based on principles going back hundreds of years. Contract law and the basic common law principles underlying this, plus housing and landlord and tenant statues, in both private and public housing, have been defined, interpreted and refined over the years. It’s an interesting field when the basic historic principles of housing law and landlord and tenant law, as they have developed, are fully explained, as you will find in the first 40 pages of this book. I would recommend anyone involved with rental property to read that. Housing laws is a changing feast; it’s hard to keep up with the changes which come thick and fast through new legislation and regulations emerging out of Parliament. This book is about as up-to-date as you can get in a book of this magnitude and depth, covering as it does the recent Deregulation Act 2015, including the retaliatory eviction measures, the new section 21 notices and the immigration right-to-rent rules etc. Given the complexity of this and many other Acts of Parliament relating to this area, for the layman, the landlord, the industrious letting agent, housing advisors and solicitors, there is therefore always a need for good clear analysis and clear interpretation which brings together the numerous strands all in one up-to-date volume. This book easily fulfils such an aims. Published in 2015 this is just another book in a series of Diane Astin’s books on property law which is an authority in its field. It’s a brilliant reference for all those wanting instant access to all aspects of housing law. As with all legal texts for use by the layman and the professional alike, the test is: are the basic principles presented in a lucid, organised and understandable fashion? Does the text provide a practical and clear guide through the myriad of cases, rules and regulations to make clear-cut decisions possible? In my view this book does just that. It’s a bit like consulting an expert barrister, without the pain of their fee! Starting with the basic principles of occupiers’ rights and security of tenure, this book goes on in various sections to cover public and private housing law, the various kinds of tenancies and importantly more recent issues surrounding Legal Aid, the Human Rights Act, the Equality Act 2010 and the Data Protection Act, Sentencing and Punishment of Offenders Act 2012, Anti-Social Behaviour, Crime and Policing Act 2014, The Immigration Act 2014 and the Deregulation Act 2015. The common law issues of lodgers, resident landlords, succession, assignment and subletting are all covered in detail including the living and tenancy conditions surrounding these and tenancies in general. A section on leasehold and leaseholder’s rights is followed by sections on possession claims, harassment and unlawful eviction. Housing benefit is covered in detail, along with homelessness tests and decisions, allocation of social housing, community care, improvements and adaptations and the various grants and subsidies available. Finally a large section covers the all-important rules on civil court proceedings and the now all important civil procedure rules; rules to be followed before starting and during civil proceedings. There is a large table of cases and ones on statutes, statutory instruments, and the European legislation as it affects housing law in England and Wales. 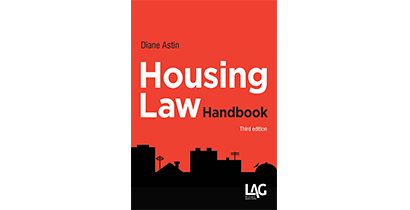 At around 900 pages we are talking here about a large comprehensive volume, but for anyone who wants a really thorough but concise and authoritative reference to Housing Law in one volume – this is it. I can heartily recommend it. Next articleIs the Buy-to-Let Boom Over?